Almost by chance, I came upon the Wikipedia page of the Château de Barbezieux, in the Charente department. The current castle was built on the site of an earlier motte and bailey style castle which was partly destroyed during the Hundred Years War. According to Wikipedia, it was rebuilt at least partly in order to provide work during a time of famine. There are photographs on Wikimedia. There is a tendency, I suspect, to associate work relief with the modern welfare state. However, various forms of relief have been going on since time immemorial. Castles were expected to pay their way, as a centre for the administration of estates, and the profitable dispensing of justice. I don’t have any particular interest in British castles, but much of the stuff written in English is, well, English. I was reminded of that because I’ve been puzzling over the roofs of castles. 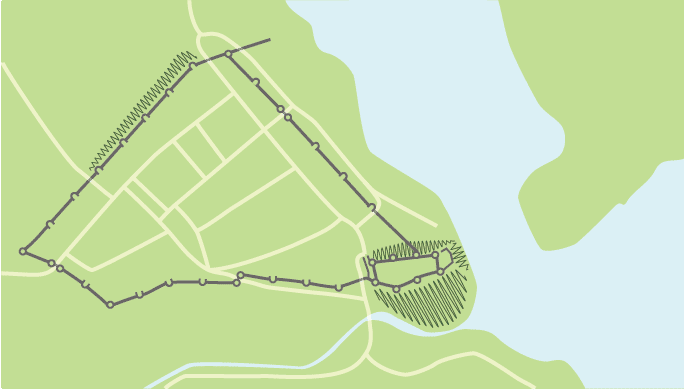 The structures with crenelations have roofs that do not extend over the walls. I’ve been wondering how they shed the rain. Scholars debate the scope of the word castle, but usually consider it to be the private fortified residence of a lord or noble. This is distinct from a palace, which is not fortified; from a fortress, which was not always a residence for nobility; and from a fortified settlement, which was a public defence – though there are many similarities among these types of construction. These arise when the central government ceases to be an effective bulwark against violence and, by necessity, delegates the defenses to private lords. While I was surfing the internet, I found a blog post that had some nice photos of some castles. I didn’t bookmark the page, so I can’t give a link, but in one of the comments someone wrote that it was a shame that the U.S. missed out on “the whole castle building era.” A shame? Thank heavens. Fortifications are the mark of conflict and the fewer one has in all likelihood the more peaceful and time and place happened to be. Castles only look romantic today because the need for them is no longer there. I made this for myself because I’m a very visual person. 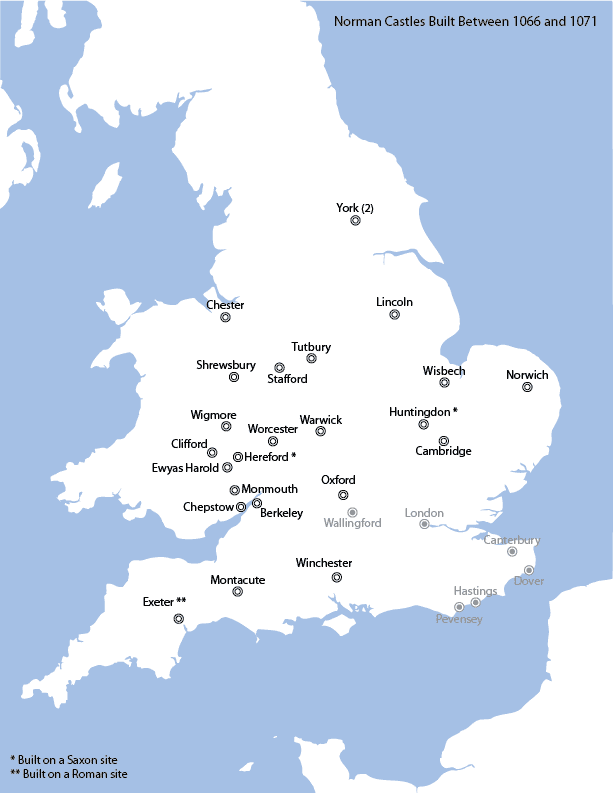 The locations listed in gray were the castles built as part of the initial conquest of England by the Normans. You can see the concentration of castles near the Welsh border. When people advocate for anarchist or radical libertarian ideas of government I wonder how good their grasp of history is. My short fascination with walled cities led me to look at the town of Conwy in Wales and I made this picture. I aimed more for aesthetically pleasing than accurate and I did it quickly, so don’t use it as a reference for anything. When I visited Wales many years ago, we went to Caernafon and Beaumarais, but we weren’t specifically touring castles, so we didn’t go to Conwy despite the fact that it was right nearby. I wanted to go hiking and my ex is a linguist, so Wales was a pretty obvious trip for us. When my ex said that we had specifically gone to Wales and that he was interested in the Welsh language everyone became extremely friendly and very eager to teach him Welsh. He has unusually good language learning abilities and I was pretty much left in the dust, so I can’t say that I can even speak a word of Welsh, although I can make a stab at the pronunciation of place names. That double L? It’s a voiceless alveolar lateral fricative. Whoopee! I’m not joking. My ex was thrilled. It’s also a good place for hiking, So we were both happy. I wouldn’t have minded the castles. I’m not the romantic sort and never gave them a lot of thought before, but they were more interesting once you start thinking about how they were built and used. However, we could have added another week on our trip if we started down that road. There are a lot of castles in Wales. Many were built during the English conquest of Wales and were designed by the architect Jacques de Saint-Georges d’Espéranche from Savoy.